We know Tor is a very good online security tool that can protect your internet privacy including hide your online tracks. But for normal people, Tor seems a little bit hard to figure out. You have to download client, configure browser. Do we have a quick way to use Tor Network but no install any clients? The answer is Yes. Pick A Proxy is a web based Tor proxy gateway, it lets you choose some premium Tor proxies that from around the world, hide your real IP address and protect your privacy. The best benefit is you do not have to install a Tor client but surf in Tor Network, that means you are still under coverage. It offers many choices, like use special proxies that focus on one country, or use top 30 fast proxies, or most stable proxies, or use all proxies except one country. I think best way to use this web based Tor proxy gateway with a Firefox add-on - FoxyProxy together, it will make you much easier. Let me show you how to use it. They can also set up http or https protocols, but after I tested that they are not stable, use socks is better than http protocol. If you like you can use a proxy pac file. Now, it is not support FTP or Gopher protocols. It also supports Hamachi VPN and Stunnel setting. After you all set you can go to this page for test your IP address. 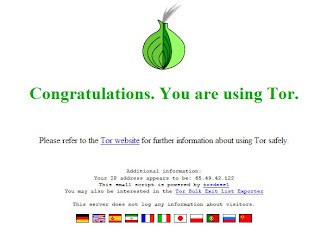 If you see this screenshot that means you are in Tor Network. I must say, this web based Tor proxy gateway is not fast as Tor client, it works but not stable. I think it is an alternated Tor client. If you do not have Tor client you can use it to surf websites under Tor Network coverage.